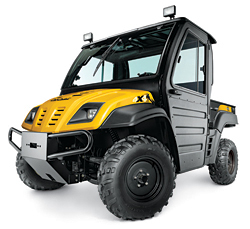 The Volunteer 4x4 EFI features a 31-horsepower, liquid-cooled, gas engine, and towing and payload capacities of 1,400 pounds. The vehicle can travel up to 32 mph, and its bed can accommodate 1,000 pounds. It also features 12-inch aluminum wheels, trail tires, a heavy-duty air filter, a 60-amp alternator, floor mats, and a bed mat.